Detroit’s population grew from 994 thousand in 1920 to 1,569,000 in 1930, meaning it was the fastest growing large city in the nation. For the most part, the new construction was to provide housing for the additional residents consisted of single-family homes because land was readily available within the city. Indeed, the city annexed much outlying land in that decade but none since then. However, there were attractive apartment buildings put up throughout the city since an excellent street car system made it feasible to get to employment centers from most residential areas. These two apartment buildings well illustrate the architectural style of the early 1920s. They were designed by architect Glen K. Sprague for himself. That is, this was a capital investment of his designed to provide him substantial income from the rents. I do not know if he succeeded. I do not know of any other buildings in Detroit designed by this architect. By 1920 or so, West Chicago Boulevard west of Woodward was lined with the elegant homes that still comprise the Boston-Edison Historic District. Apparently, some investors presumed that the residential appeal associated with West Chicago Boulevard might be extended with the construction of apartment buildings from the Boulevard’s intersection with Hamilton on to its intersection with Dexter. The extensive and attractive Sac, designed by John Donaldson and John Meier at West Chicago and Linwood were completed in 1925. And just across West Chicago Boulevard from Sacred Heart Seminary Albert Kahn’s magnificent Congregation Sharrey Zedeck Synagogue was being constructed. 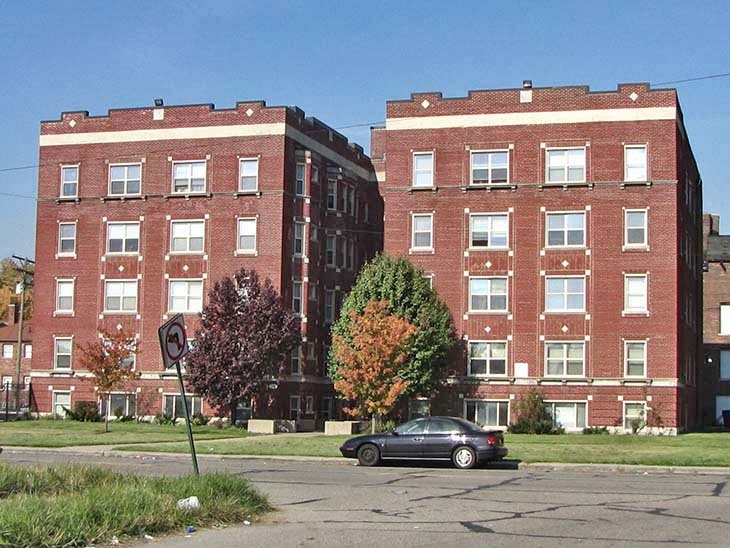 If the city of Detroit in the 1930s had added population as rapidly as in the 1920s—that is, a gain of 575,000—perhaps the apartment buildings shown above would have many peers in this area. Alas, the Depression had severe impacts on Detroit and the city gained only 50,000 new residents in the 1930s. The revitalization of Detroit that occurred after bankruptcy ended in 2014 has been followed by tremendous investments in downtown, Midtown and the east riverfront. Some adjoining residential neighborhoods, including the North End and the West Village, appear to be substantially benefiting from the recent Detroit Renaissance. The Atkinson Avenue Historic District—not far from these apartment buildings on West Chicago—is another neighborhood on a positive trajectory. Will there be a revival for the buildings shown above?